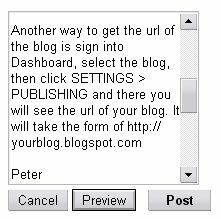 In old Classic Blogger, to get the feed URL, you click the SETTINGS tab, then FEED and you will find the feed URL there. Now in Blogger Beta, you can't do that because the feed URL is not displayed there. So how do we get the feed URL. You will have to scroll down to see the other feed URL. The last one is the feed for comments. Acknowledgement: I was alerted to this by This tip was provided by Chuck of The Real Blogger Status. Latest update: It is no longer possible to contact Blogger Support directly. You will have to post your problem to Blogger Help Forum where Blogger Employees and Blog*Stars are actively helping with problems. Update 30 March 2008: This should have come earlier, but so short of time. Now you can only contact Blogger support for account and TOS (Terms of Service) issues via Blogger Support Contact Form. If you are not already signed into Blogger, you may have to sign in before you get to the Contact form.. All other requests for support should be directed to Google Blogger Help group. I am also providing support at Blogger General Discussions. "i've followed your instructions using your guide on how to contact blogger and i got my deleted blogs back in less than 24hours!" Update 13 December 2007: The goal post keeps shifting and I don't know if I can keep up, but this post How to get deleted blog back. It may say deleted blog, but even if your problem is not a deleted blog, the post may still help you. The blogger for whom the above post was made reported back she got her blog together with 700+ post back!!!! "Dear Peter. Thanks so much for all your help, tips , and tricks. Blogger support DID reply to my report and they were very prompt. My problem has resolved somewhat. Thanks so much again." UPDATE 26 October 2006: Blogger Support has made themself very hard to contact now, probably because of the roll out of Blogger Beta. Recently, I needed help from Blogger support myself and followed my own advice in this post, that is try to help myself first by going searching through the Help section and posting my problem to Blogger Help group, etc. I didn't get a response from Blogger Help group and I was taken on a merry-go-round in Blogger Help section, and finally ended up in a suggestion form with a message that I will not get a reply. I did two things - contact a person (whom I cannot reveal to protect his privacy) and I emailed support@blogger.com. I did get quite a quick response, and not only that, it helped solve my problem. So I can add to my positive experiences with Blogger support described at the bottom of the post. I don't know what response you will get, but if you do get an automated email that did not help, make sure you reply to that email. Update 5 June 2007: Just tried the contact form at Blogger Support Form and after being taken to a few pages, did finally ended up in an actual contact form. However, as I was just trying it out, I didn't fill up the form and wouldn't know what will be the result of filling it out and submitting it. When you are really in trouble, I am sure you will take the time to do that. (P.S. The link to the contact form is near the bottom of the post under "Write Blogger Support" (in red) but to be fair to Blogger support, do read through the rest of the post before you click on that link). Blogger support makes their contact form or email difficult to find as they want support seekers to first use their HELP (close new window to get back to this page) section. You should also try searching through, or posting your problem to the Blogger Help Google group (close new window to get back to this page). Look also into Blogger Buzz (close new window to get back to this page) and Blogger Status (close new window to get back to this page) and Known Issues in Blogger Beta (close new window to get back to this page) to make sure it is not a known issue that can be solved on your own. This is fair and you should first do that. But if you can't find the help you need, here is the link to their contact form: Write Blogger Support (close new window to get back to this page). You can also email them at this address, support@blogger.com, but the best way is to use the "Write Blogger Support" link given above, as you will be given a reference number for additional contacts. You will invariably receive an automated email. Do make sure to replay to that email. I have got an email from a reader saying that he accidentally deleted his blog. After contacting Blogger support, and after a series of email, he has got his blog undeleted!!!! So folks, there is hope. This is my own personal experience. Recently, I needed to have the word verification for POSTING (not for comments) removed to enable me to publish by email. I contacted Blogger Support via that contact form obtained by clicking the "Write Blogger Support" link above. As usual, I received a robot email. I responded to the email immediately, explaining that their email didn't help and explained my problem in detail. I got the word verification removed WITHIN 24 HOURS!! Also, if you have a suggestion to make to Blogger, you can do so via this contact form: BLOGGER WISHLIST (close new window to get back to this page). There are numerous complaints about formatting problems when posting via email - unwanted line breaks at places not desired. Well, someone posted a solution to this problem, (see link to the post at the bottom of the post), and I am going to test what he suggested by actually publishing this post via my Yahoo email account. What revrickm said in his post was that Yahoo has a provision for setting the screen width (number of characters per line) for both incoming and out going messages. He suggested 50 characters for outgoing messages and 72 characters for incoming messages. I will use his suggestion for this post. I believe the actual numbers should depend on your main column width and the font size, so you may have to play around with the numbers to get it right. To set the screen width for messages with Yahoo mail, click OPTIONS at the top right-hand corner, and then select GENERAL PREFERENCES under Management. You will see the boxes for setting Screen width for incoming and outgoing messages somewhere in the middle. Set it to the number you want, then click SAVE. Well, I have done that, I have composed the post in the Yahoo Compose window and now going to send the email. Let's see what happens. revrickm also described in his post a shareware "Clean Text" with which you can copy the posted code, run it through Clean Text, remove the returns, and paste the newly reformatted code back into Blogger and republish. To read more about it, go to A look inside Google AdSense. Update: Blogger now automatically adds [OLDER POSTS] [HOME] [NEWER POSTS] at the bottom of the page and the method described in this post which is difficult to implement is no longer necessary so thank your lucky star. I heard they were going to implement PREVIOUS POST and NEXT POST feature for the newly rolled out Blogger Beta, but looks like that is not the case. However, if you want this feature for your blog, you can still do it manually as follows (this will be for both Blogger classic as well as Blogger Beta). Go to the newer post and get the url of that post from the address bar (permalink) and replace "url of newer post with that url and publish the post. Similarly, do that for the older post. This will have to be done for every post on which you want that feature. If you want to simplify the process, sign into Dashboard, select the blog, click SETTINGS > FORMATTING, then somewhere at the bottom of the page, in the POST TEMPLATE box, paste in this HTML code in that box. Save and republish. Then each time you do a post, that code will appear at the bottom of the post, and all you have to do is to get the url of the previous post and next post and paste it in the appropriate place. Note: Please do not try to copy and paste the above codes because the special characters is an image as if I try to type the characters in the post, it will just be displayed as an empty space, and if you try to copy and paste the codes you will get in the pasted codes a HTML for an image instead. You have to manually type it in yourself. Update: See John's comment in the Comments section for other more complicated method of doing this, which will involve tampering with the template. Haven't had time to test it out yet. When I do, I'll do an update on this post. Since I had wanted to test Blogger Beta, I decided to test doing a table in Blogger Beta to see if it has the same result. The result is here to see: Testing posting tables in Blogger Beta. Well, the result is the same, large blank spaces are created above the table. In fact, I hope if you clicked on that link, you wouldn't think that is an empty post because the table is way down the page. 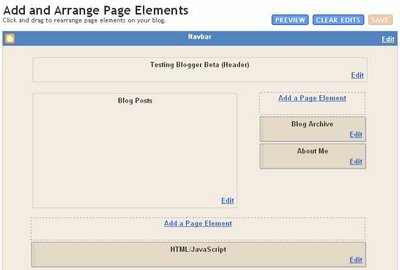 This post is to test if the normal way of formatting a HTML for a table causes large spaces as in the standard Blogger. tags for each time I press the ENTER key. That is why you are seeing a lot of white spaces above the table. There are 2 ways for you to get around this. One is to sign into Dashboard, select the blog, click the SETTINGS > FORMATTING tabs, and somewhere near the bottom of the page you will see CONVERT LINE BREAKS. You will have to set this to NO, but by doing so, you may play havoc with the formatting of your posts such as no paragraphs, etc. The other way is to write the HTML code for the table in one single line, without pressing the ENTER key. Alternatively you can type the table codes first in an easily understood format and when everything is done, use the DELETE button to get the codes into a single line without line breaks. Note: the codes were actually typed in a single line without once pressing the ENTER key, but I had to break it up as otherwise, the long line of codes will cause my sidebar to slide to the bottom of the page. Notice now that the table you see in the second link doesn't have any large white spaces above the table. Update 12 September 2007: This update should have come earlier, but as they say, better late than never. There is an easier way. Refer to Easier way to avoid large space above the table or tables when using HTML codes for table for Blogger. UPDATE 3 April 2009: It is now possible to use the dates and time POST OPTION to schedule posts to be published in the future by chosing a future date and time for the POST OPTION. Thus now if you put a future date, the post will not be published until later. To use the date and time POST OPTION to make a "sticky post", you will first have to publish using current or past date and time and only change the date and time to the future after publishing. UPDATE 5 November 2006: Now, there are two ways to do a "sticky post", the one mentioned in the update below, and now another one in this post: Bloger Beta: How to add Adsense ads or permanent "sticky post" at the top main column of every page of the blog (click "BACK" button to return to this page). However, this expire at that future date (2007 I believe) which is not too distant in the future. When that date is reached, you will have to future date it again, and this will cause the URL of the post (permalink) to change. That means dead links, fruitless search engine results, etc. Update: Got a couple of comments from readers that they are not even aware that there is a new Blogger Beta. Please understand that this is a beta, and there are bugs to iron out, which I suppose they eventually be. However, if you have not been invited to join the beta, you can still start a new Blogger Beta blog to test it. Go to Blogger in Beta, read about it, and if you want to start a new Blogger Beta blog, look for the link "create an account" and click on it. (Ah, I might as well give you the hyperlink here for your convenience: Create an account). I would suggest you proceed with caution. Use an email (Gmail) account that is not associated with any of your current blogs, as I have read reports of numerous problems with not being able to post to current blogs, can't see current blogs on Dashboard, etc. 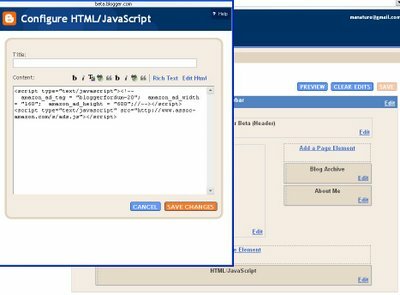 If you do decide to sign up for a test blog, I think you will enjoy the many new features, and especially if you do not like to deal with HTML, this will be good for you. LATEST UPDATE: You can add an extra "Add a Page Element" to the header by yourself. See Adding a graphic to your blog header. I have used it to add a graphic to the header as well as an AdSense link unit. It is important to always backup the template, especially if you do a lot of customization. To backup the template, sign into Dashboard, select the blog, click the TEMPLATE tab, and highlight all the text in the template editor (ctrl+A). Right-click on the mouse and select copy. Click the START button at the bottom left of the page, scroll to PROGRAMS > ACCESSORIES > NOTEPAD and click on NOTEPAD to open it. 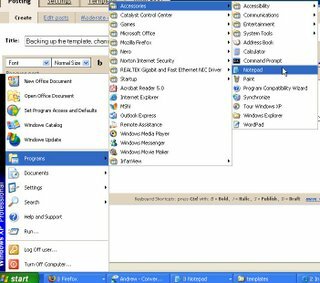 Then paste it into Notepad (right-click+paste) and save it under a suitable file name, for example blognameDate, preferably in a folder specially for template backups. 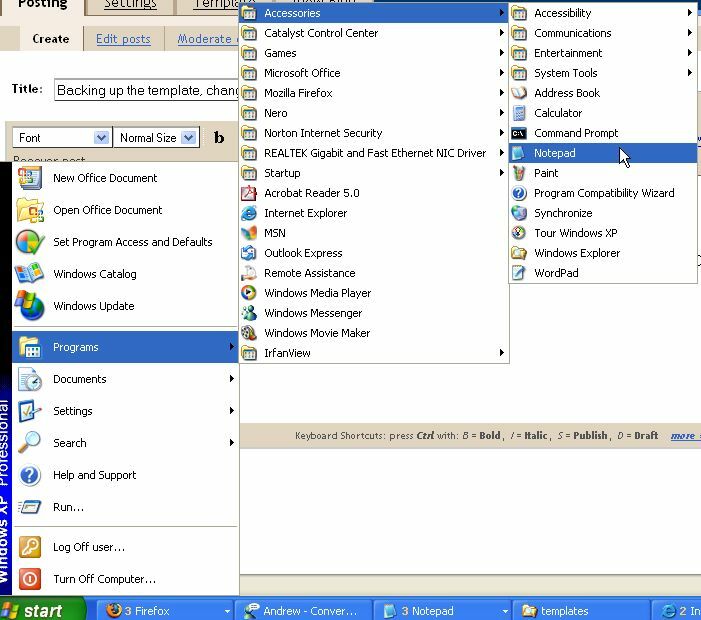 After you have pasted the current template into Notepad and saved, under the TEMPLATE tab, click PICK NEW and select a new template. 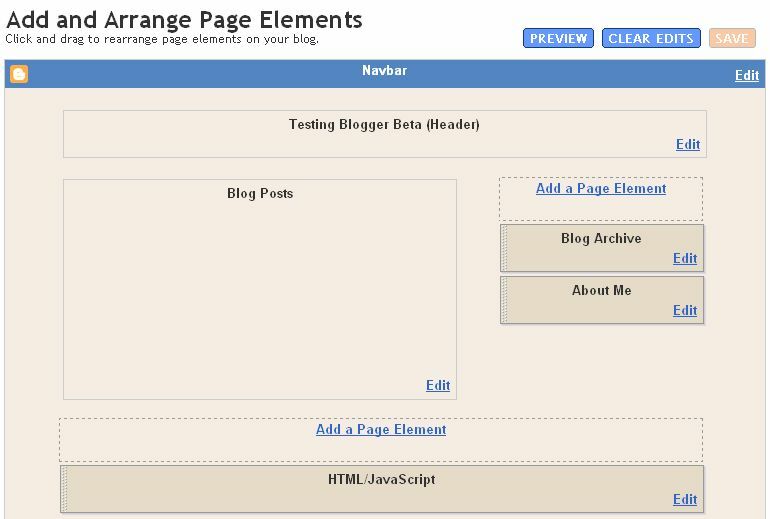 On the other hand, if you are changing to a non-standard Blogger template (downloaded from website elsewhere), the in the above step, instead of right-clicking on the mouse and select copy, select cut instead, then in another tab or window where you have the new template, copy the new template, go back to the Blogger post editor, right-click inside the now blank post editor window and select paste. Click PREVIEW and if you are satisfied, click PUBLISH. for the following block of codes in the template. As before, you can change the text "Websites I visit" to anything you want. Currently, Blogger does not offer a way to get the IP address of commentators for those using the Blogger commenting system. However, if you have installed a real time visitor counter for your blog, your blog is not a very high traffic blog and you have enabled comment moderation via email notification., you can get the IP address of commentator. First you have to install a real time hit counter like Statcounter on your blog if you do not have one already. There are various free hit counters available, including sitemeter and statcounter. Sitemeter is good for summaries. I prefer statcounter for its more detailed statistics. To see how to install a hit counter, go to How do I track visitors to my blog. When you want to track visitors to your blog, sign in to statcounter and click on "Recent pageload activities". You will be taken to a page where details of such as date, time, IP address, etc. will be shown. See screenshot below. (Click screenshot to enlarge) When you want to find out the IP address of a commentator, open the email notification for that comment. To get the timestamp, reply to the email for comment moderation. 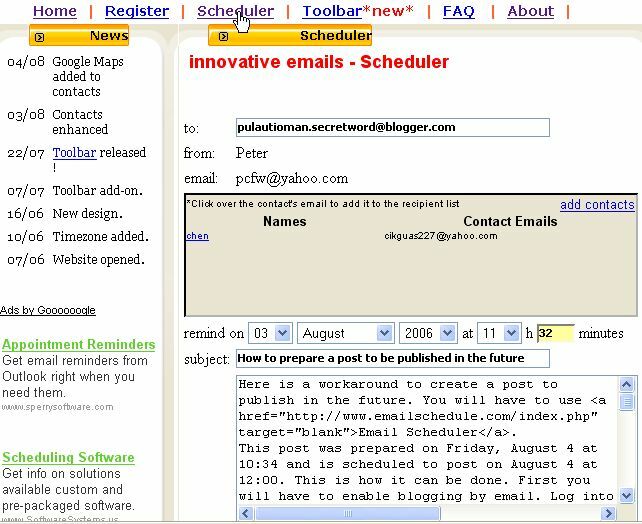 Subject: [the original Blogger Tips and Tricks] New comment on New: Blogger contact form gadget. Compare it with the time shown in the visitors log. When you see a match, then very likely that is the person who made the comment. Get the IP address of that visitor from the log. The idea for this was suggested by a comment from Dr. Lisa Cuddy. This tip can be useful if you want to ban someone who is leaving comments you don't like as shown in this post: How to ban a person from your blog or website (click "BACK" button to get back to this site). UPDATE 16 August 2008: Answer to a question in the comment about whether it is still impossible to get the commentator's IP address for Blogger: "Yes it is still not possible. You can only guess, including the country. But if your blog has low traffic, it can be a very good guess to the point of certainty. If a person comment at, say, 3pm and from morning till night, that is the only visitor to the blog, than you can say that that visitor you see in your visitor counter is the one who commented." When you post, do you have to go through the irritating step of word verification where you have to type in the text you see in a graphic into a text box to be able to published. If so, your blog has mistakenly been identified as a spam blog. This word verification will interfere with the blogging by email and a method of preparing a post to be published in the future. There is one more good reason to get word verification for posting removed. If your blog has been marked as a spamblog, Blogger keep it out of the Next Blog list (the one on the navbar which when clicked takes you to a random blog). This means you can be losing potential traffic from people clicking NEXT BLOG. You can get this irritating word verification turned off. To get it disabled, sign into dashboard, select the blog, in the POSTING tab, click CREATE. 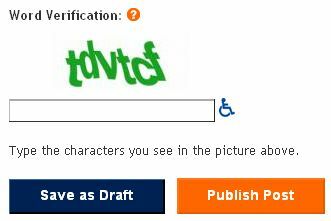 Look for the word verification. (see screenshot below). You will have to click on the ? button next to the word verification. Clicking on the ? button will take you to a page where you can fill out a form to request a human to review you blog and remove the word verification. Another way is to contact Blogger support via their contact form. You will get an automated email. Make sure you reply to the email. This blog had word verification turned on and I got it removed within 24 hours this way. I have 2 blogs with word verification turned on, and I have tried both methods to get it turned off. My experience with the first was takes some time, while the second got the word verification turned off within 24 hours. Well, I have found many times that by simply changing web browser, or having more than one browser opened at the same time, I succeed where I failed before. Recently for example, I tried uploading a picture to a Blogger post and it said done, but when I checked the post, the picture was not there. This happened a few times. I changed to FireFox, logged in, upload the picture and succeeded the first time. (Happened again while I was preparing this post). See post What to do when you can't post, upload photos, etc,. And if you have more than one browser opened at the same time, you can be logged into one Gmail account, for example, and with the other browser, you can be logged into a different Gmail account. I have Gmail account for private use and Gmail account to put on my blog for visitors to contact me, etc. There are still many who are still using only Internet Explorer, and if this is the case there are even more reasons you should get FireFox. Blogger is optimised for FireFox. And the tabbed browsing is just fantastic. Once you have tried it, you will never want to go back to Internet Explorer again. Then there is a very effective built-in pop-up blocker built-in. Even if you already have FireFox installed, you should get the Google Toolbar. With this, you can conveniently do spell checking within the Blogger post editor as well as other online forms. This is more convenient than using the spell checker built into the Blogger post editor. 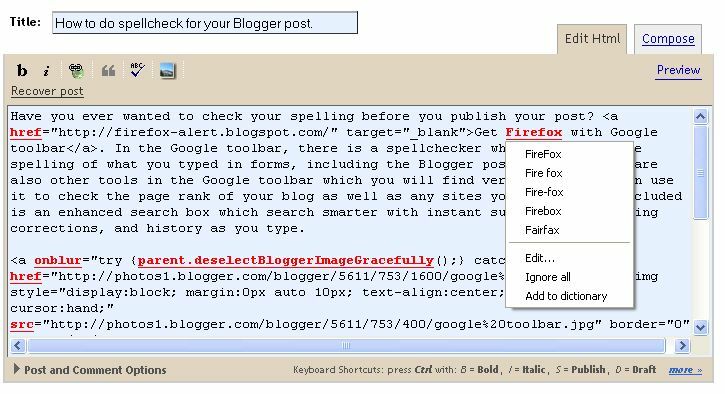 (See "How to do spellcheck for your Blogger post") With the tool bar, you can check the PageRank of your blog as well as any other websites you visit. With the Google search box built into the toolbar, you can search just the current web page or the whole web. There are many other advantages of having a Google toolbar with your FireFox. Just a moment ago, I tried to log into my Gmail account. The only browser I succeeded in doing this was Internet Explorer. The other two, FireFox and Opera returned error messages. However, don't interpret this as Internet Explorer being the superior browser. Everything depend on the situation at that particular point of time and the situation. FireFox, I waited and waited. When I could not wait anymore, I opened another browser Internet Explorer. The page opened and I logged in in seconds and read my reports. At the time of writing this update, FireFox is still trying to open the AdSense login page. I am not saying FireFox is no good, but it is a big advantage to have more than one browser in your computer (click BACK button to get back to this page). Changing browsers does often help in various difficult situation. Note: If you are one of the 80% of surfers who use only Internet Explorer, you can download FireFox directly from this page by clicking on the link "Get FireFox with Google Toolbar for better browsing" at the top of the right sidebar. element' showing as it should. Thank you, environman. You're my super-hero!" Update April 26, 2007: Since a while ago, when I experienced some difficulties with Opera while using Blogger, I have installed and used Flock, another web browser. I have been pretty satisfied with it. So now, I have 4 browsers in my computer. Update 23 July 2007: For a further reason why you should have many browsers in your computer (click BACK button to get back to this page), see How to make a clickable link. Read the section on "Make tool tips appear for hyperlinks". Here is a workaround to create a post to publish in the future. You will have to use Email Scheduler. This post was prepared on Friday, August 4 at 10:34 and is scheduled to publish on August 5 at 12:00. This is how it can be done. First you will have to enable blogging by email. Log into Dashboard, select the blog, click SETTING>EMAIL, then in the Mail-to-Blogger Address box, type in a secret word in the box and make sure you tick Publish box. Save and republish. Then create an account at Email Scheduler. Click "Scheduler" at the top bar and you will see a window like in the screen capture shown below. Type in the Mail-to-Blogger Address in the "to" box, the title of your post in the "subject" box and prepare your post in the content box. Then choose the date and time at which you want the post to be published in the "Remind on" boxes and click "submit". If you want to confirmed your email is saved, click on the "Pending email" button on the right sidebar. This is how you will do it if you are familiar with HTML. If you are not familiar with HTML and if you want to post photos, there is an alternative. Log into Blogger Dashboard and prepare your post as normal. You can do it in either the Edit Html mode or the Compose mode, but when you are finished, make sure you change over to EDIT HTML mode. Highlight the prepared post and copy. 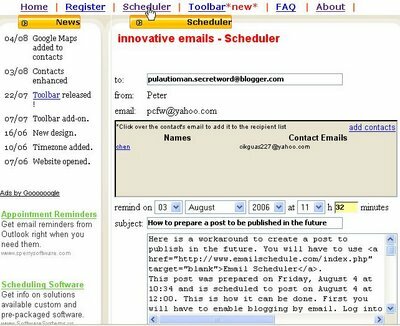 Follow the method as described above, but instead of preparing your post in the content box of Email Scheduler, paste your post prepared in the Blogger post editor. Chose the date and time you want to post and click "submit" and you are done. Note: If your post editor have word verification turned on, you will first have to get it removed or it will interfere with your future posting. This blog had post editor word verification turned on. I contacted Blogger Support and the word verification was removed within 24 hours. To contact Blogger Support, see How to contact Blogger Support (click "BACK" button to get back to this page). You will normally receive an automated email. Make sure you reply to the email. Update: This post was prepared on Friday, August 4 at 10:34 and was scheduled to publish on Saturday, August 5 at 12:00. How, the post was published on Sunday, August 6 between 9.00 and 12.00 according to my computer time. I live on the other side of the globe from America. You may also want to take a look at iContact for your blog, especially business blog. Sent by Peter via the free Email Scheduler service. UPDATE 7 November 2006: There is a tip to add a ? to the end of the URL to see updated post, but I have found that it does not always work. I had to resort to viewing the post/blog with different browsers or click F5, shift+F5 or ctrl+F5. "I can't get any new posts to show up on my blog. They show up as having published, but won't post to my blog." Questions like these crop up very frequently on forum. Sometimes, changes have been changed to the template and have been previewed, saved and republished successfully, but the changes are not reflected on the blog when you view it. When you face problem like these, perhaps they are just due to a cache problem. Try adding a ? 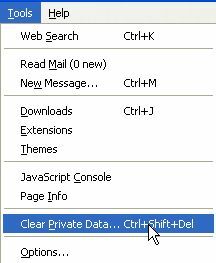 to the end of the blog URL into the address bar and press the ENTER key. (This tip was given by Rose DesRochers). For example, like this: http://bloggerfordummies.blogspot.com/?. Or press ctrl+F5 or ctrl+Refresh. If you see the new posts or the new changes, then it is confirmed it is only due to a cache problem. I personally have used it before, and most of the time it works, but sometimes, it doesn't. In that case, you can try other methods. Testing spell check for Blogger Beta (close new window to get back to this page). If it is a browser cache problem, you have nothing to worry about as others will be able to view the new posts. The problem only exists on your computer. If you want that resolved too, try clearing the cache (temporary Internet files). See bottom of the post on how to do that. It is a good idea to occasionally clear your cache, but do keep in mind that you may temporarily have to deal with minor inconveniences like a page downloading slower, etc. If it isn't a cache problem, check to see that your new post have not been saved as a draft, because if it is saved as a draft, it will not be shown. The solution then is obvious. Publish that draft. 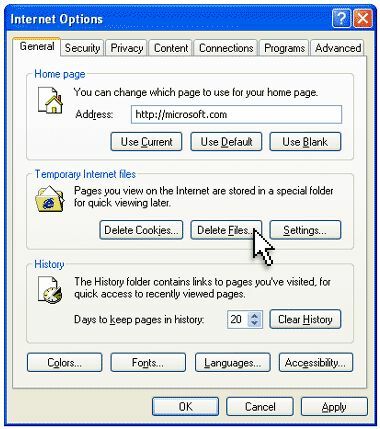 In the section :Temporary Internet Files", click the DELETE FILES button. When you click that, a pop-up will appear. Tick "CACHE". You may also clear things like browsing history, etc, but it may mean that the convenience of being able to select a page already visited before from a list of choice as you begin to type in an URL in the address bar will no longer be present. Have you ever wanted to check your spelling before you publish your post? Get FireFox with Google toolbar. In the Google toolbar, there is a spellchecker which can check the spelling of what you typed in forms, including the Blogger post editor. There are also other tools in the Google toolbar which you will find very useful. You can use it to check the page rank of your blog as well as any sites you visit. Also included is an enhanced search box which search smarter with instant suggestions, spelling corrections, and history as you type. The spell check in the Google toolbar is a vast improvement over the built-in spell-check in the Blogger post editor, which involve a pop-up and you have to hunt all over the text to find where the misspelled word is in your text. For spell check in the Google toolbar, the misspelled word is highlighted in the post editor window itself, and you can see the misspelled word in context with the rest of the text. See screenshot at the top of the page. In addition, there is Auto-fill which optionally fill online forms for faster shopping, etc. And you can opt to highlight the search terms in sites found via Google searches. And FireFox has tabbed browsing which is a vast improvement over Internet Explorer and make for much better browsing experience. And you will love the built-in pop-up blocker. To check spelling within the post editor window, click "ABC Check" icon on the Google toolbar. The icon will change to "ABC Stop", there may be a slight delay, depending on the length of your post, then the post editor window will change to blue and the words that need correction will change to red. To edit the word, click on the highlighted word. A drop-down box will open containing a list of suggestions, etc. Click on the suggested spelling if suitable or click "edit..." to edit it yourself. If the word need no correction and there are more than one, click "ignore all". If there is only one, you can ignore it and just go on to the next highlighted word. If there are words that are wrongly marked a spelling mistakes, you can choose to add it to the dictionary. When done, you can either click the "ABC Stop" icon on the toolbar or or click on the post editor window and click "Stop spell checking" in the pop-up and continue preparing your post. 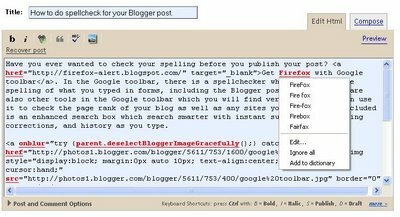 Footnote: Even though there is a built-in spell checker in the toolbar of the Blogger post editor, it involves pop-up and is cumbersome to use, and I (and many others) don't like and find it very inconvenient. Note that if you upload many photos, your post will contain a lot of HTML tags for the photos which will contain words like onblur, img, src, alt, photos1, etc, and which will be marked as spelling mistake. You will then receive a message like (from memory, will update if I do a similar spell check later, and if I remember) "Your most contain more than 100 spelling mistakes. Only the first 100 will be shown. That can be overcome by adding those special words into the dictionary so that the next time you do a spell check, it will not be marked as mistakes. (this has been corrected in the Blogger Beta built-in spell check). UPDATE: For a comparison between the spell check in Google toolbar and the upgraded built spell check in Blogger beta, have a look at this post: Testing spell check for Blogger Beta and the spell check in Google toolbar (close new window to get back to this page. Note: You can download FireFox with Google toolbar directly from this page by clicking on the text link "Get FireFox with Google Toolbar for better browsing" at the top of the right sidebar.